A day to celebrate our Independence and wear, eat and drink Red, White & Blue! I have to say that I was excited when I found this cocktail online at the barnonedrinks website! I haven't had Hpnotiq is quite a few years and was excited to try it again. I was given a bottle by one of my husbands Best Men at our wedding and have liked it ever since.......but that was some years ago. I gave tonight's cocktail 4.5 shots out of 5. This is a very yummy cocktail! The citrus vodka blends very well with the Hpnotiq and sprite to give it a yummy citrusey flavor that goes down pretty smooth. This is a perfect way to celebrate the 4th surrounded by family, friends and cocktails! 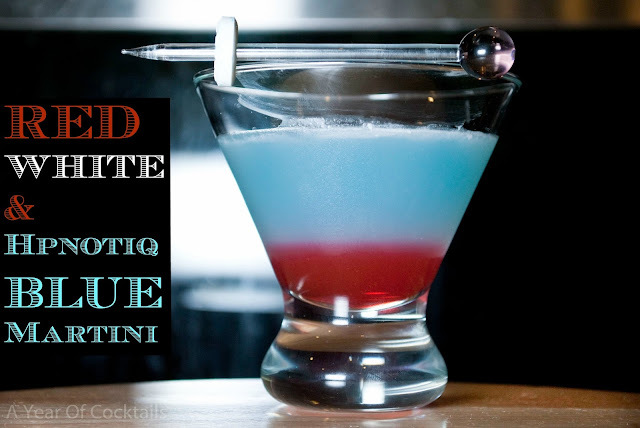 I hope you find a patriotic cocktail in color or name......or just a cocktail to celebrate our national holiday with today! In a shaker add ice, Hpnotic, citrus vodka and lemon-lime soda. Shake it up well and strain into a martini glass. Pour the grenadine down the middle of the glass and enjoy. Cheers to you Ed! Thank You for introducing me to Hpnotiq on our camping trip all those years ago. I think you would have liked this cocktail.